Leather is a perennial favorite with many jewelry makers. It is easy to understand why. The natural material is warm to the touch and wonderful to work with. One international supplier of fabulous leather cord is the German company, Endless Leather. They do both retail and discounted volume sales. What strikes me about their supplies is the range and quality. They supply many different types of leather cords, round and flat. Shown below is some leather and findings they recently sent to me for review. New for them are the pastel camouflage suede leather cords (below left). Something very unusual is the metallic gold and black reptile print cord (below right). Both these types of cords consist of fine stitched leather with a cotton center, making them much for flexible than if they were solidly leather. The magnetic clasps were impressive and included both shiny and brushed metal ones. I thought the subtle colors of the camouflage suede were well suited for designs with gemstones as you can see with my donut pendant necklace. The grey camouflage suede picked up the patchy grey on this gemstone. If you don't know what gemstone it is, and I don't, it is probably safe to say it is a quartz. Most of the common gemstones we use fall into this huge category. As you can see, I came up with a new way to wire the cord on. I also had to wire the cords together with another length of wire behind the gemstone as well as to the wire wrapped part. This leather cord is certainly thick enough to balance the size of this donut. I was pretty impressed with the magnetic clasp. 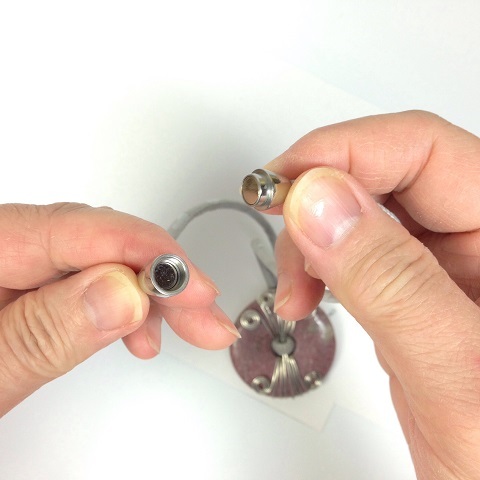 The magnet was very strong and I had difficulty pulling it apart. I will be testing it out with this unusually heavy donut necklace to see how well it endures. 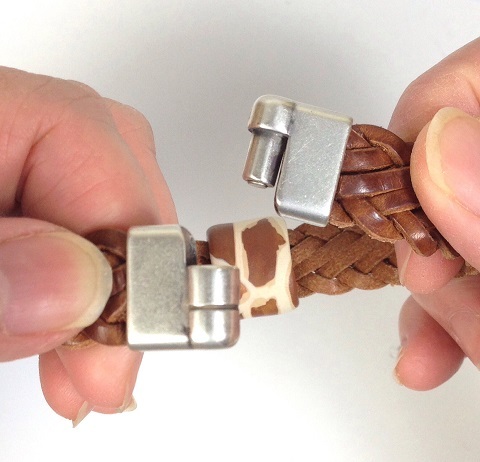 The braided leather made for a super simple unisex design with an animal print Samunnat Nepal polymer clay slider (courtesy of Kazuri West). I really liked the wide magnetic clasp. The pin design makes it more secure. Once I knew how to open it, putting it on and taking it off was easy. Some time ago, I was so taken with the look, that I bought some pretty printed leather from them. As you can see adding sliders makes the designs pop! Clean and simple designs are any occasion wearable. These are incredibly fast and easy to make. But fitting leather bracelets accurately can be awkward. 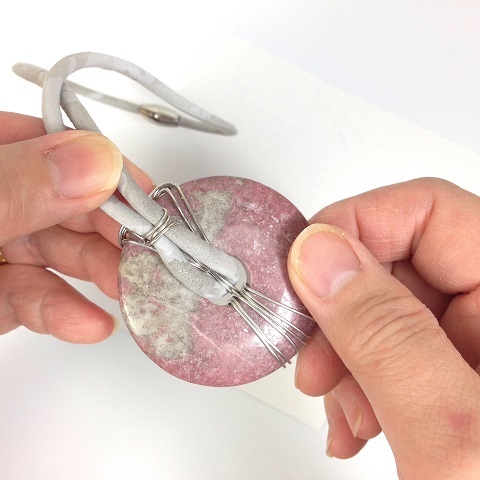 So tune in later this week for the tutorial on how to measure and make leather bracelets with any clasp! It ends in a week's time at 6 pm EST Monday, January 19 , 2015 . I will pick the winner randomly and announce the results as soon as possible after. So be sure to leave a contact email if you don't have an online link or make sure you come back and check! Otherwise I will redraw in a week. Good luck! gorgeous giveaway, I absolutely loved your creations!!!! Love the leather!!!! Endless ideas and creations to be made with these supplies. Love to win. Pick Me!!!! :-) Tammera Crystalbeadbiz@gmail.com Thanks for the chance to win! The cord looks awesome! Would love to work with the camo one :) I am a blog/email subscriber, and have shared on Facebook, Twitter, Pinterest and Google+. I always love leather....so versatile. I love your projects. What a great giveaway. I love leather and this looks likes some awesome leather. I will definitely be checking out the website. www.lindysdesigns.com. Thanks for the chance win. Great designs. I like the magnetic clasp also. Love, love, love the leather! What a great giveaway! Thanks for the chance to win! I nearly bought some gemstone donuts today but decided against it, but after seeing this post I've changed my mind again and will get some after all-thanks for the great idea!! Beautiful leather goods. Great giveaway! Great giveaway ! I like the ideas of magnetic clasps ! I'm excited about this giveaway. The cords look gorgeous. Glad to know about your site! I have been wanting to do leather for about a year and need lessons in how to attach clasps and where I can find them. Would love to win the giveaway to get me started on a new medium as I am a self taught designer. Leather is so soft and gives a whole new look from traditional jewelry. Would love to win this! Love the donut pendant too! I love all the soft leather looks, so different from what I am see elsewhere. I would love to play with any, really all of these. Oh how I love the leather. I never win anything, but ia so wanting to start working with leather. Love your work. Leather isn't something I've used in my jewelry making before, & this giveaway would get me started. (Uh-oh -- I see another addiction starting!) The leather looks like it is high quality & I like the variety of sizes, colors & finishes of the magnetic clasps. Thanks for everything you do for the beading & jewelry-making community! Fantastic give away, I started working with leather in the 90s repairing stirrups and reins. The almost unlimited uses for leather are both useful and beautiful. Would love to win some of the cords and findings from Endless Leather. Thanks for this chance to win. I have not used leather and would love to win and try it. the samples are awesome. Thank you again for offing to us. I love your wire wrapped donut! Very pretty. Count me in for the giveaway. These leather cords are beautiful and I love the way you've attached one to the donut! 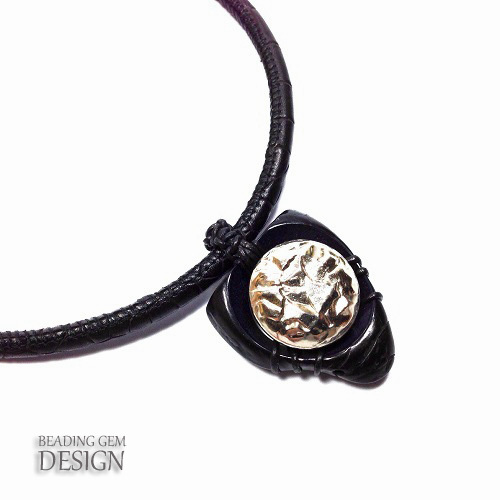 I love the unisex look and appeal of leather with gemstones and hope to use it in my jewelry designs. I'll be sharing on my facebook pages and on twitter ! I would love to win this!! I subscribe to your blog. Thank you for the wonderful giveaway opportunity. The leather looks great and is exactly in tune with the pieces I am working on for Spring 2015. Fingers crossed! I DO love this leather!!! I would love to try out those clasps!! I'm so glad that I get another chance to win this prize! Maybe a 2nd time is the lucky one. Either way, thanks for being here for all of us! I'd love to win. Leather is lovely. A great giveaway, thank you ! I've never worked with leather before and I would love to try! Once again, thanks for hosting this wonderful giveaway! I am a blog follower and pinned your generous giveaway on my Pinterest contest board. 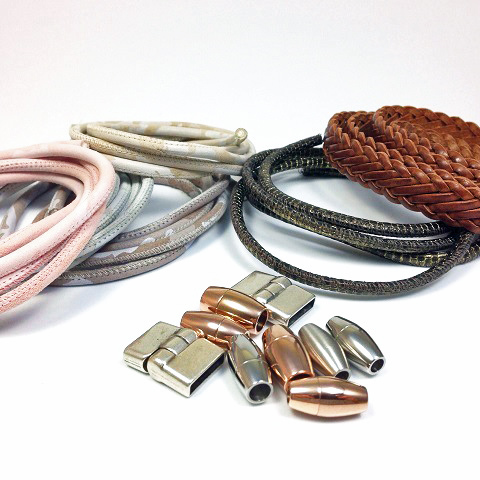 great selection of leather products and clasps! The thought creations are endless!! I love the clasps and the variety of leather available. I've just started exploring leather from local sources. There's nothing to compare around her with the leather shown in your blog. What a cool variety they have. Thanks for the chance to win some of it. By the way, I love your blog. I found you just recently and look for your post eagerly every day. I'd love to try the leather cords and clasps! What I like about leather - and why I don't use cloth in my designs - is that you can wipe it off when it gets dirty. I always feel that cloth gets a grubby look to it and sort of stays that way and leather can be maintained with some care to it. Throw my name in there Pearl - I'd be happy to give it a whirl! Always love leather projects but never had a chance to make any. Wouldn't mind winning these supplies. Love this giveaway! Yes, your doughnut is quartz, good guess, lol! It is hard to tell from just pictures when they dye so many stones! Anyway, I would love to get a hold of some of those magnetic clasps, too cool and the braided leather and round leather cord make my mouth water! I love leather! This would be so great to win. I am a blog subscriber. I have just started to work with leather for jewelry and Endless Leather have lovely ideas to be tried. Please enter my name in the draw for Endless Leather. Love your design and those clasps are great. I just bought a mandrel to make lampwork beads that fit that wide leather so would love to win this! I've been having fun with different leathers for a couple years now and would sure love to try some of the camouflaged round. Gorgeous products. Would love to win. This leather looks spectacular. You always have beautiful jewellery accessories. I would definitely love to win this, so please pick me. What a great giveaway! I have a couple of doughnuts and didn't know what to do with them. And I love the look of the wide magnetic clasps. Wow, what a great giveaway! I would be excited beyond belief should I happen to win this! Thank you for your emails and all the great information you make available to us! I live the braided leather with the magnetic clasps. I would certainly use this in one of my designs. Lovely! What a lovely giveaway. I love working with leather. Oooh! I love leather! I love those little bracelets at the bottom but would almost feel I was "cheating" to make something so simple - almost but not quite! I also love how you attached the top pendant - very cool. I used to tool leather art and mount it on boards. I would love to try it with jewelry. Thank for this gorgeous giveaway. Love the style of your pendant the leather looks awesome. I'm a suscriber and I shared on google. Leather? Leather? Did someone say Leather? I love leather. I want more of it. Please select me. Pleeeaaaassssseeeeeeeeeeeee. Or not. Thanks for offering it. How I would love to win this leather gift. I am a blog subscriber. Your pendant is beautiful. Very beautiful leather pieces. And what a great variety. Would love to work with any of them!!! Would love, love, love to win the "Endless leather $50 certificate for the leather supplies". I an just starting to work with leather and love it. OOO love the leather!! Would love to win. Am a blog subscriber too. Love the animal print stuff. Would love to win, so please pick me! I could definitely use a gift certificate to their shop! I am in love with some of their clasps. I shared this awesome giveaway on FB. I love this new leather with the cotton core. I dont use leather much as i find it too stiff for most of my designs. I would love to win a gift certificate to try this brand out. These are beautiful! And the way you attached the donut is ingenious. Would love to win the leather supplies!! 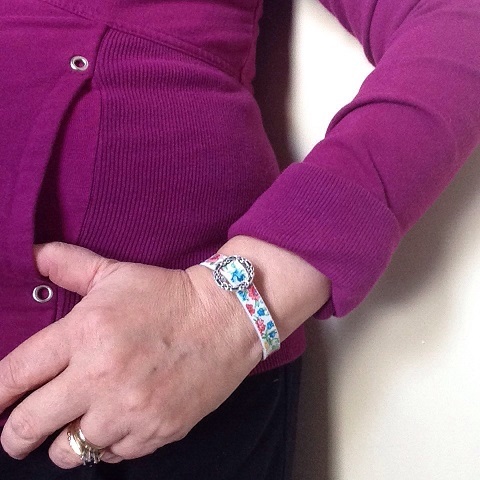 I started with brooches but am moving into leather bracelets. It would be great to win this giveaway. It would give me a chance to try out many of my new design ideas without having to go shopping first. Love working with leather and some do my customers! What beautiful leather choices! Haven't seen such a variety of leather anywhere else! Ideas are flowing! Love what you did with the donut and wire. That printed leather is gorgeous.I'd love to get my hands on some! Looking forward to reading how to get a bracelet to fit well too. Wow!! Lots of comments on this post. I was given a Christmas Gift of turquoise donuts. Please enter me in the contest. Another great idea and another great giveaway.. I'm new to using leather in my jewelry making and am always looking for techniques and ideas--thanks! I don't work a lot with leather, so this is super exciting! I have never used leather this thick and love the stiffness and stability it provides as well as the unisex versatility! My daughter would love this, she loves to craft and create. great giveaway! i love ur creation! i shared it on my twitter. Thanks so much! I follow and shared. I crochet jewelry so I could use this! Lovely jewelry so pretty and unique. I'd love to win some supplies! These projects are gorgeous! I've never used leather in jewelry making, and I would love to try. I know I'll become a convert! Thanks for the chance to win! I'm an email subscriber. Thanks again! What incredible products! I'd love to win this and share with my son. Those are some gorgeous leather pieces. Awesome giveaway....thank you. Endless Leather has a huge selection of wonderful products! Would love to win this awesome giveaway! Thanks for the chance! Hi, I just started to use leather to make jewelry. I love working with it :) it would be so cool to win the giveaway. I subscribe through email to your newsletters. tanyabroeckx@gmail.com Thanks for making it possible.